A. Put the 'bad guys' into power (eg Saddam, the Ayatollahs). B. Get the 'bad guys' to fight each other (eg Iran-Iraq war). C. This keeps America's rivals (eg Iraq, Iran) weak. D. And makes lots of money for America's military-industrial complex. Russia and China need to watch out. 1. President Reagan went to war with Iran. By 1987 America was involved in an 'undeclared' naval and air war against Iran. 2. Both Iraq and Iran came to believe that the the USA had manipulated them. Israel supplied spare parts for the Iranian air force’s U.S.-built built jets throughout the war. With Iran-Contra, the USA supplied weapons to Iran. Iran-Contra was in many ways Israel's idea. The Iran-Contra affair convinced Saddam's Iraq, rightly, that the U.S. was trying to play both sides of the conflict. The Saudis, Kuwaitis and Emiratis gave Saddam billions of loans to fight the war. Jordanian “volunteers” fought with Iraq. Iran believes the US inflicted the war on them. Iran notes that the United Nations did not condemn Iraq for starting the war and never sanctioned Iraq for the use of chemical weapons. 3. By 1987, Iran's oil exports were minimal and its economy was shattered. However, the Iran-Iraq war strengthened the leaders of Iran. 4. "So expect another conflict to make Iran more extreme and more determined to get the bomb while it rallies Iranians behind the mullahs." Iran will look for "our vulnerabilities in Afghanistan and Bahrain, Israel’s in Lebanon and the Saudis’ in Yemen to exploit." The idea is to achieve US control of every country in the region. And help the USA's military-Industrial-Narco complex. In 2011, the US sold $66.3 billion of weapons overseas, which is nearly 78 percent of all global arms sales. The top customers were the USA's Moslem colonies, such as Saudi Arabia and the United Arab Emirates, and the US colony of India (Top gun: Saudi, India deals push US arms sales to record $66 billion). According to the UK's Daily Star, SAS HUNT BIO ARMS, US, UK and French special forces troops are in or around Syria. And the special forces are accompanied by MI6 and the CIA. 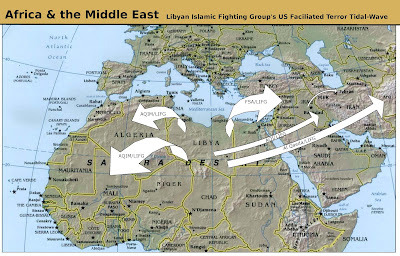 "Brookings Institution's Bruce Riedel in his article, "The New Al Qaeda Menace," admits that Al Qaeda in the Islamic Maghreb (AQIM) is now heavily armed thanks to NATO's intervention in Libya, and that AQIM's base in Mali, North Africa, serves as a staging ground for terrorist activities across the region." "NATO's terrorist blitzkrieg across the Arab World will not end in Syria. "It will continue, if allowed, into Iran, through the Caucasus Mountains and into Russia, across China's western borders, and even across Southeast Asia..."
ARAB MONARCHS IN BIG TROUBLE?